There exists a community and in it is an organizer who is intelligent, passionate, and dynamic. She has focused her efforts on mobilizing the people in that neighborhood to speak up on issues that concern them, and use organized actions to create change. She has become a staple in the neighborhoods, with her own spot in the local coffee shop, and a deep relationships with almost everyone around. She has inspired the people in this community to be more than they thought they could be and one day she is going to leave. On that fateful day when she and organizers from all over must say goodbye to the communities that they have worked so diligently in, what will happen to the people in that community? Will they continue to organize and mobilize each other, will direct actions still take place? A lot of times, the answer to that question is no. 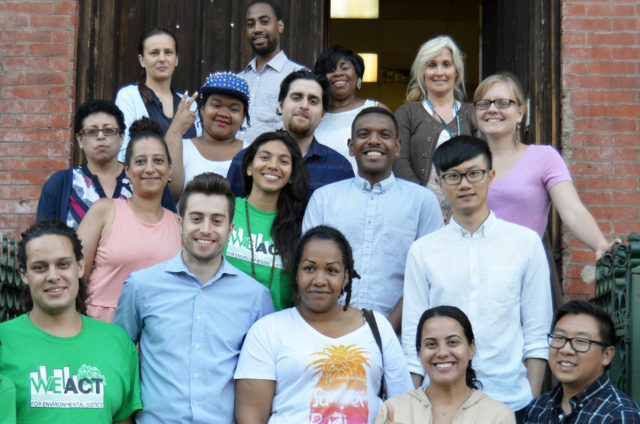 The West Harlem Environmental Action Inc. (WE ACT) with their Environmental Health, Leadership and Justice training (EHJLT) has the solution, and its building organizers from within the community. “This process has been so beneficial to me, it’s incredible I have had the opportunity to see how much environmental issues connect with our communities in a way that wasn’t always clear. Between that and learning how I can cultivate my own communities by helping to expand access to healthy foods with a community garden, really has me excited for the kind of good I can bring to the people I live with. As the conclusion of this program draws near, a change in the way participants look at their communities is already clear, and there is little doubt that this year’s graduates plan to make a difference in their neighborhoods in the way that only people who live there can. A good community organizer has the power to change hearts and minds, but that doesn’t always translate into a way of life. By the end of this program, 25 hearts and minds will be changed, and they will now be equipped with the tools to build a sustainable army of world changers only a door knock away.